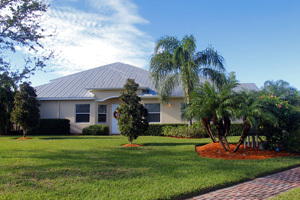 Vero Beach villas are in high demand in our local real estate market. The Villas at Bridgepointe offer nine different floor plans and an array of customized features. Dennis Witherow and Regatta have introduced a brilliant new product line in the location known as “five minutes from anywhere”, Indian River Boulevard. The beach, The Ocean Grill, Ocean Drive, Holy Cross Church, Miracle Mile, a new Publix, and the Hawk’s Nest course are but a few minutes away. “The Boulevard” has become an A-list address over the past 12 years. Regatta’s Riverwind became a haven for beachsiders who wanted high-quality new construction, impact glass, low-maintenance, lake views, and a fitness center. More recently, five new development phases have commenced along “The Boulevard” within one-half mile of Riverwind, including The Villas at Bridgepointe. Regatta is offering nine models in Bridgepointe. The unique aspect of Regatta’s offer is that buyers have the opportunity to either modify the design plans, or to start from scratch. Regatta’s goal is to help their buyers design a truly custom home. There are lakefront sites and “garden” lots available. Buyers can choose from a variety of pools, fountains, spas or landscaped oases. As with the home design, home buyers will have the opportunity to select from pre-designed rear-yards, or to design their own. Regatta’s custom Vero Beach villas feature stainless steel Kitchen-Aid appliances and finished kitchen backsplashes. Other standard features include a paneled and vaulted great room ceiling, a creative crown molding and trim package in all living areas. Buyers have the ability to have real input into the design of their home. Furthermore, as with all Regatta homes, these exciting new villas feature a recirculating hot water loop. The loop provides hot water in a few seconds to everywhere in the house. Vero Beach Villas at Bridgepointe are virtually maintenance-free. Home owners have access to a beautiful clubhouse, a large resort-style heated pool, and a complete fitness center. The Villas at Bridgepointe offer all of this and are “five minutes to everywhere”. Prices for these custom Vero Beach villas start in the mid-$300s. While Bridgepointe is the new gold standard for villa product in the area, there is much more to know about this exciting, low-maintenance, “lock-and-leave” property option. DiMarzo Realty Inc. specializes in the Vero Beach real estate market including patio homes for sale, villas, condos and more. If you have any questions about living in the Vero Beach area, give us a call at (772) 713-9898 or send us an email.